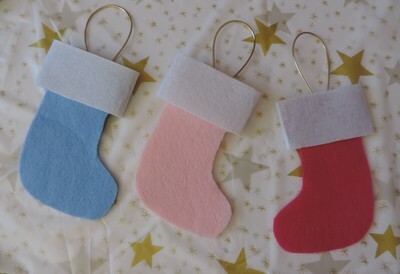 Looking for a last-minute Christmas craft, this is a simple one to make with the kids. 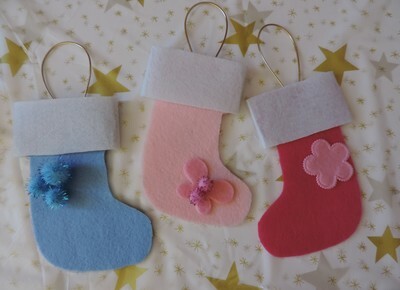 This no-sew felt stocking is really easy to make, and can be personalised to suit anyyone. Fill it with candy, chocolate or any other gifts, place on Christmas tree or give as presents. Cut your stocking template. Place on felt sheets, trace with marker and cut. You need 2 for each stocking. Use hot glue along the edges, little by little to start gluing the 2 pieces together. Skip the top part. Cut a long piece of white felt and place around the top part. Glue. Attachs on christmas rope, if using, as you glue the white part. You can leave it to here and write names on the white part of the stocking or decorate the stocking. Insert candies, or any of small gifts (pens, earrings, lip gloss, stickers) and place on Christmas tree.